A blog being an informational platform to publish and share your ideas and knowledge to a wider range of audience is now one of the major part of the World Wide Web. With more and more people opting to start their online journey, we can simply put blogs as the pillars of the internet. Today there are more blogs on the internet covering a wide variety of topics now more than ever. And with the growing popularity and usage, there are now tons of ways to start and manage a blog online. According to various researches done over the years, blogs have also become one of the popular content marketing strategies. And by 2018, the percentage of people and companies using their online blogging platform as a way of marketing and promoting has increased to a substantial amount. Even the buyers or potential customers researching the product and services before investing rely on blogs, e-books as well as third-party analysis reports online. Another similar research also shows that over 6.7 million people publish posts on a blogging website on a regular basis and over 2 million blogs are published each and every day. And as we have it, Blogging continues to make an impact on the digital landscape more and more each day. Why Use A Professional Blog Template? If you are a hobbyist writer or prefer to share your knowledge on a professional level, what are you waiting for? An online platform where you can contribute to your related sector providing useful pieces of information, tips, tricks, as well as tutorials, can go a long way. Not only this but a blog can also be used as a social sharing platform where you choose to display your personal details and experience! And to aid your need for a perfect way to start, we have your back! With our list of HTML5 and CSS3 premium blog templates, we have simplified the process of searching and choosing the best one for you. Each one of the templates that we have included is feature-rich with amazing and stunning looking interface. Not only this but the responsiveness and advanced customizing options add the extra appeal to your blogging landscape. So feel free to check out our list of hand-picked blog templates and choose the one that best suits your needs! Create a great blogging website from scratch without all the hassle of hiring the professionals and paying a hefty sum. Pivot Is a multipurpose HTML website template that is based on the ultimate block based layout. perfect for almost any type of website niche out there, this template is flexible, versatile and certainly worth a try. It comes with over 70 content blocks that makes any website creation process a breeze. Responsive and retina-ready, the template is visually impactful. Accompanied by an amazing range of features, users also get access to tons of easy customizing elements as well. It is built on the amazingly powerful Bootstrap framework. Not to mention the clean and well-commented CSS and HTML codes backing it up. And because of its amazing flexibility, it certainly works wonders no matter what niche you are trying to set up. It even includes the Variant Page Builder which is an innovative way to add in all the creative ailments to meet your requirements. For easy social sharing and email management, it comes with MailChimp integration and social icons and media options. Connecting to any of your social platforms is a piece of cake. Choose from multiple Home Page designs, layout structure, and even header and menu styles to give it your own unique touch. In addition to this, this amazing template comes with creative Google Fonts, smooth parallax sections, CSS animations, and effects to keep things interesting. You can also add in a custom menu, change the color schemes and make it your very own with a few tweaks here and there. In addition to all the niche-based pages, it even includes a Contact page, Error Page as well as Login and registration option to give you a head start. So what are you waiting for? Get your site up and running right away with Pivot. Talking about awesomeness, we could not help but mention this vastly featured template Kallyas. 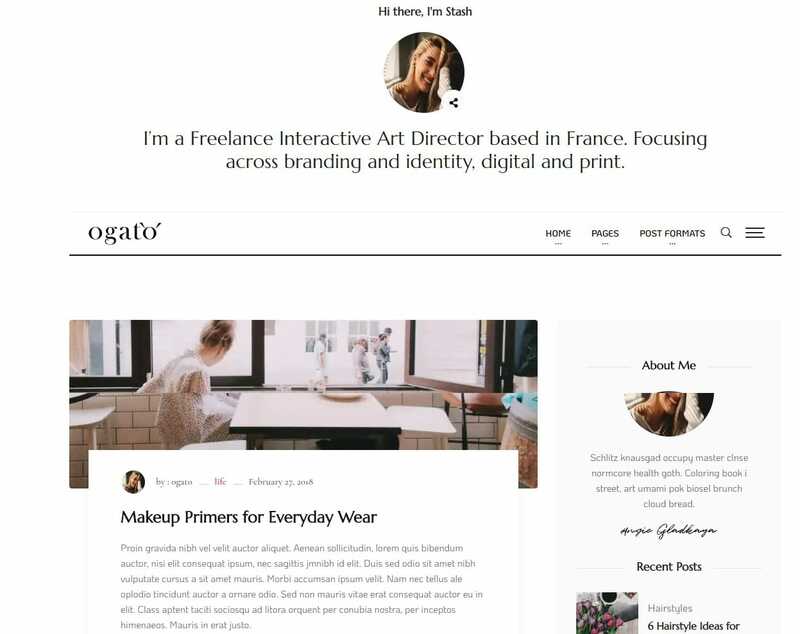 Whether you wish to use it as a premium blog template, corporate and professional template or simply start a portfolio, this flexible template adjusts to it all. The ultimate package that one might need to start anything online, it takes care of all your requirement effortlessly. Starting from the flawless interface to the user-friendly options, it has it all in line for you. The design is also seamlessly crafted to be responsive, retina-ready and cross-browser compatible. In addition to this, it is also SEO friendly so that it affects your traffic and SERP’s in no way. But the amazingness does not stop here. It comes with tons of personalizing options that the possibilities are almost endless. Get unlimited color schemes, demo sites to install, tons of variations all in one package. You also get access to a number of Header styles you can choose to get started with. To make things efficient when it comes to handling and organizing the client emails, the MailChimp comes in super handy. But, that’s not all. Integrating your social sites and platforms is also super easy. Another great feature is surely the list of the premium add-ons and plugins that is included within the template. Get creative with the Sliders and Carousel options and add in a more engaging factor for your users to enjoy! Another one to fall under the category of the multipurpose structure is Pofo. Elegant, and clean by all means, the whole design gives off a professional feel to it. It is responsive, retina-ready and executes flawless graphics and imagery. And to top it off, it is built on the powerful Bootstrap framework which ensures an optimal performance throughout the usage. Efficient, fast-loading and optimized for SEO, this template is sure to leave a lasting impression on anyone who lands on your site. No matter what niche of blog website you aim to create, Pofo is a great start. Get over 211 HTML pages that you can choose to utilize. From Home Pages to Inner Pages to other creative elements, this premium template has it all in line for you. And to give the users a head start, the package even includes 26 pre-built demos that you can easily install and use. Talking about flexibility, it is also cross-browser compatible which ensures that your site will load fast and easy no matter what internet browser your users prefer. A collection of over 150 creative elements are also included with the package including sections for parallax, videos, blogs and more. Get gorgeous header and menu styles that you can choose from. In addition to this, the template is also designed to be SEO friendly and cross-browser compatible. It includes all of your necessity including functional Contact forms, social media widgets, Isotope filtering, creative fonts and icons, slider and carousels and not to mention the detailed documentation to help you along the way. 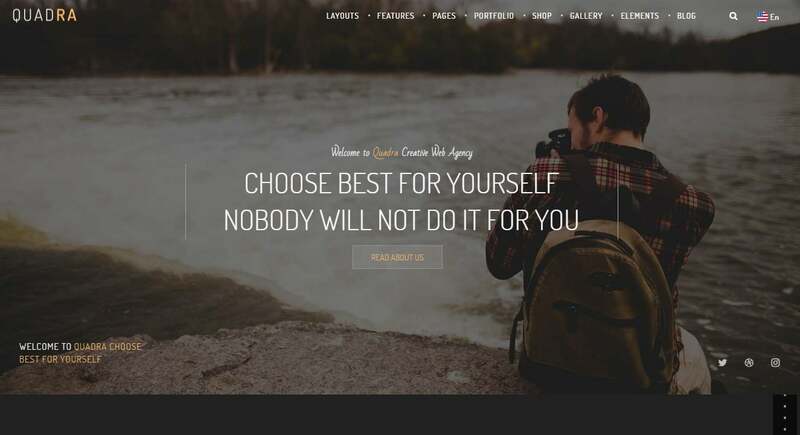 Simply put, this template is another amazing blog website template you can opt for. Now one that is designed and styled especially with personal blogs in mind, the name Let’s Blog pretty much explains it whole. Perfect for blogs of all niche, this simply crafted template is also responsive, retina-ready and jam-packed with everything one might need to get a blog started., With over 10,000 happy customers to back it up, there actually is no further explanation required. However, because we love this template so much, let’s elaborate why? The visually stunning design is based on the powerful Bootstrap framework. And it is coded with the neat and well-commented CSS and HTML. It comes with amazing variations for each niche of blogs that one can make use of. Keeping even the beginners in mind, the options available are all user-friendly and easy to use. Make your content stand out using elegant and clean typography options and all the creative elements available. This includes the sliders, galleries, icons, parallax sections, video sections and more. There are also tons of pre-built demo pages that you can choose to start with. And to stay connected integrate all of your social profiles with ease as well. The template is also designed to be RTL friendly, translation ready, SEO optimized and cross-browser compatible. Other notable features of this template include built-in shortcode generator plugin, menu style variation, unlimited color scheme options, and various Header and Footer widgets implemented. 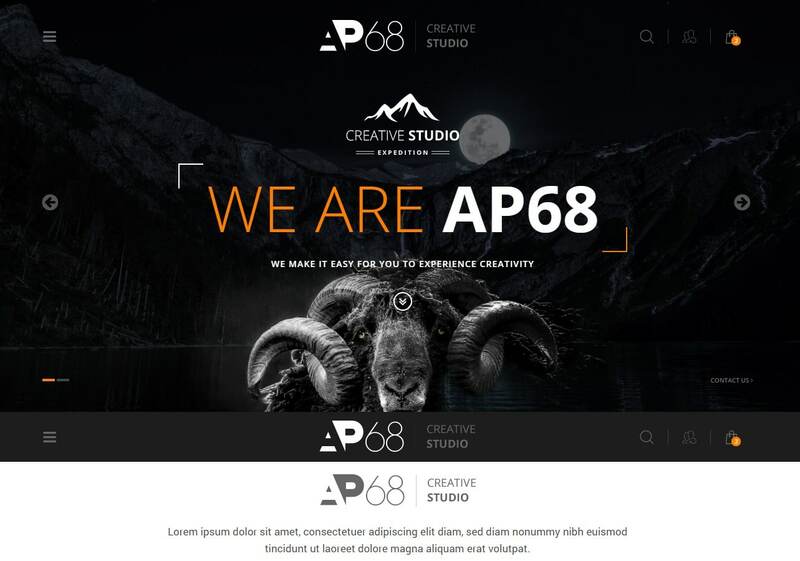 AP68 is a stunning multi-purpose HTML5 website template that can be used for any kind of website niche. You can create stunning portfolios, amazing business profiles or even blogs to keep your users engaged. With a responsive and retina-ready design, this template adjusts and fits any device screen whether it is a mobile, tablet or desktops. Based on the powerful HTML5, CSS, jQuery and AJAX coding, this template is also based on the Bootstrap framework. This template also includes Grunt and SASS files that you can use. Choose from tons of customizing options to create the perfect platform. Whether you want to create Portfolios, Blogs, Webshop or any business websites, this template is also easily customizable. Optimized for SEO, this makes sure that your website stays on the top ranks on all major search engines. In addition to this, you get tons of advanced options like Google Map route designer, Google Microdata, email-address filters as well as demanding animations. Furthermore, you can easily add fonts and icons using the Google Fonts as well as FontAwesome. The clean and unique design also includes separate Portfolio, Blog, Product Show, and WebShop Pages that you can use from. Built on the powerful Bootstrap framework and solid foundation, Canvas is a multipurpose HTML5 template that you can use for almost any type of website. Highly customizable and featuring tons of options this template is ideal for blog websites, portfolios or any other business based websites. A powerful and multi-page template, it also features a responsive and retina ready layout. With over 800 different HTML files that you can use, Canvas helps you create the website that you always wished to own. Highly customizable and well-commented codes also give you the extra flexibility and control over how your website will end up. This template gives you the freedom to choose from over 100 ready-to-use Home Page options. In addition to this, you can also choose from over 20 different niches to start. You also get 15 header styles and 10 menu styles included. The template also features the Revolution Slider along with 7 different sliders with over 20 different templates. Furthermore, the template comes with over 50 scalable shortcodes you can use to add elements to your site with ease. The Working AJAX Contact form also provides you and your users with an outlet to stay connected. The widgetized mega menu and the boxed, wide layout design adds the extra appeal. And if you are looking to start a blog of any niche, Canvas provides you with unlimited possibilities. 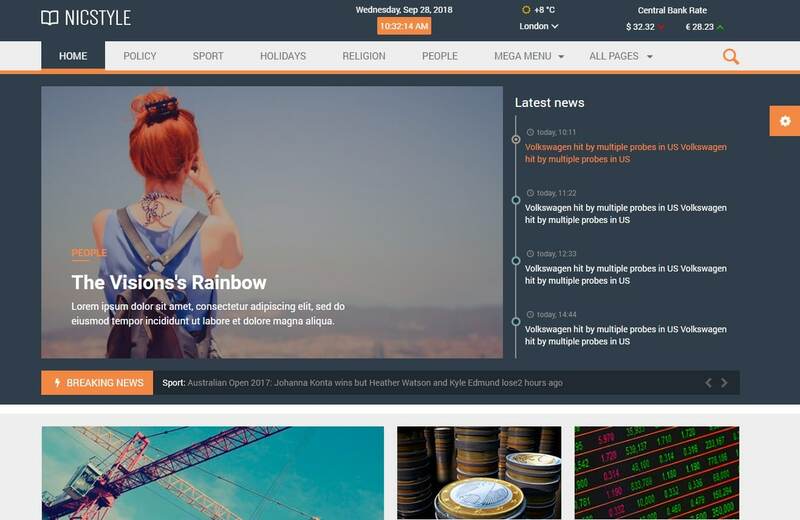 Featuring a clean and elegant layout design, Travelogue is a visually-stunning HTML5 blog template that is the ideal choice for bloggers. Suited for personal, travel, journals as well as portfolios and creative websites of any kind, this template is fully responsive and retina ready. Built on the effective and powerful HTML5 and CSS3 coding, the template is highly customizable and includes a professional feel to it. 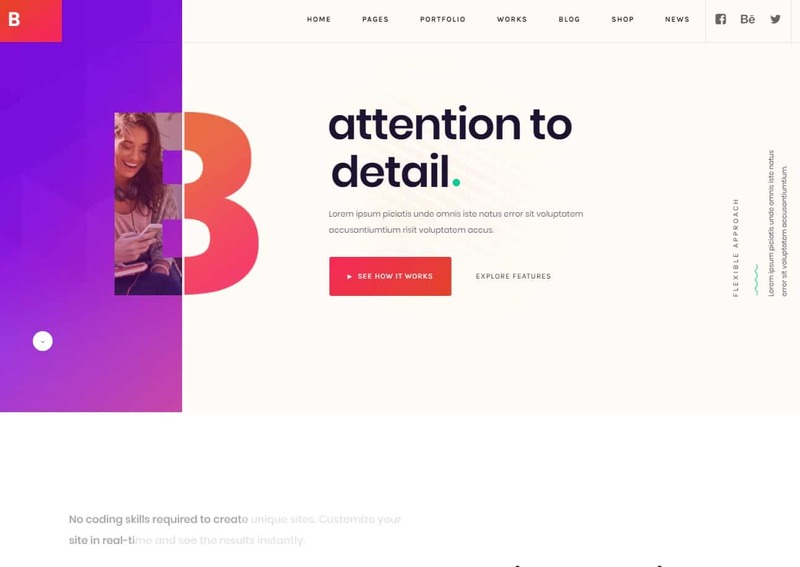 Not only is this visually-appealing, but this template is also amazingly functional and includes tons of advanced features you can use to customize your website. Add creative icons and fonts using the Google fonts and FontAwesome integration. The template also features fully layered PSD files that add the extra appeal. The blog page included uses an outstanding header that allows the option to add images or videos. Amazingly user-friendly this template is really easy to set-up and customize. In addition to this, each of the pages features amazing transition effect that differs with each page. This unique option adds the modern and innovative touch that users love. 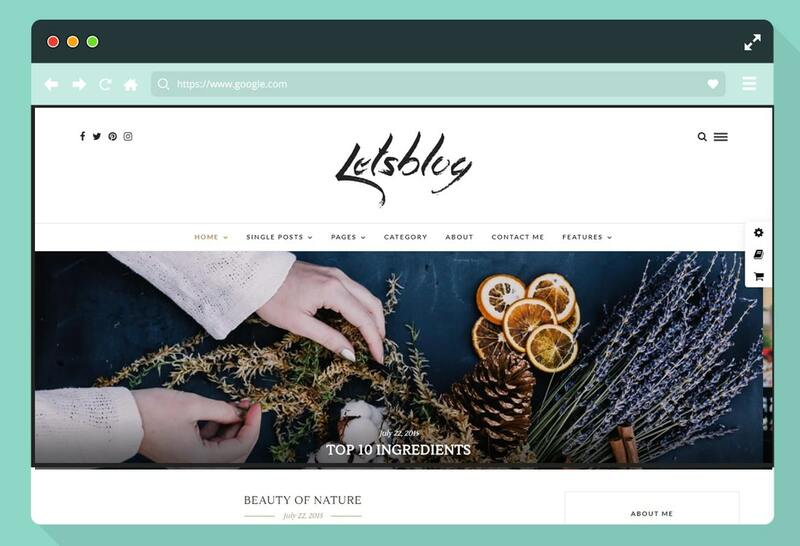 The stunning design is perfect to start your very own blogging platform, so start your online journey with this awesome blog template right away! 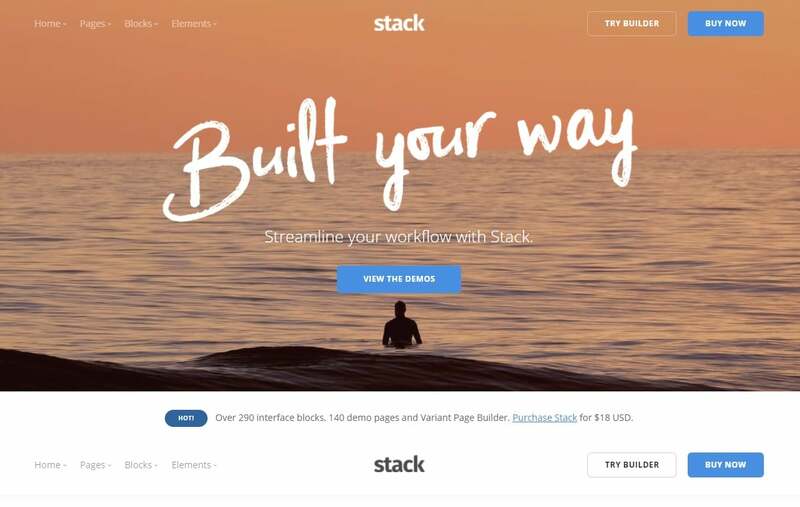 Stack is a multipurpose HTML5 website template that you can use to create a website of any niche possible. You can create amazing blogs, portfolios and even eCommerce websites as well as any corporate websites. Built on the amazing Bootstrap framework, this template is flexible and ideal if you are starting your online journey. 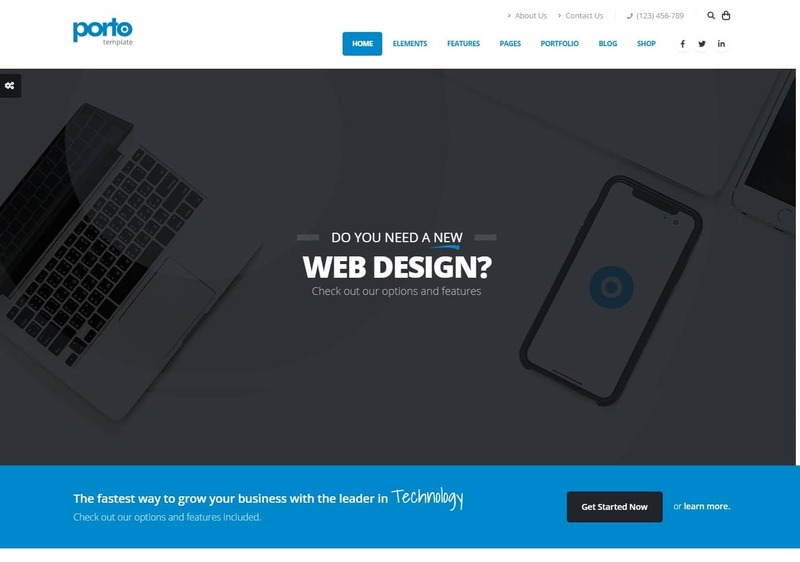 Boasting over 140 demo pages, there are tons of customizing options you can use to create the perfect website you always wished for. Blending in contemporary styling with beautiful markup, this template is also fully-responsive and mobile-ready. Highly detailed and modular design, Stack also includes over 240 modular interface blocks. In addition to this, you also get over 140 pre-made HTML5 pages that you can choose to build on. You also get multiple navigation styles you can choose from. Furthermore, you also get working AJAX forms and working social feeds to help you stay connected with your users. Moreover, this template also features masonry and lightbox galleries as well as parallax effect to add the professional touch. The template is also eCommerce ready giving you an easy access to payment method. This template is the perfect way to start. 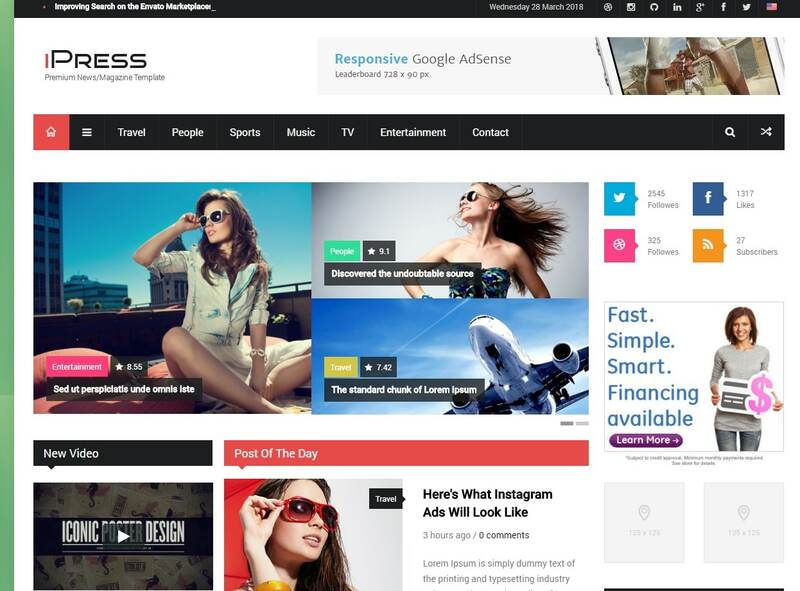 If you are looking to start your very own online journal or blog, iPress is the perfect option. It is a fully-responsive and retina ready featuring an exclusive and modern interface. This HTML5 blog template is the ideal choice for news, blog, magazine or any editorial or personal websites. With tons of customizing options, this creative and fresh looking template makes sure that your website stands out from the crowd. Not only this but it is also SEO optimized making sure that your site ranks up on any major search engines. It features a flat design with unlimited color scheme options that you can choose from. You can even choose from the light and the dark version to start with. In addition to this, you also get custom color categories and News Ticker. Get creative and add extra appealing factor using the touchable sliders and carousels. In addition to this, you also get Working PHP AJAX Contact form. This template supports RTL languages and provides support banner sizes ads. You can even add creative fonts and icons using the FontAwesome and Google Fonts. Dani is yet another amazing HTML5 portfolio and blog template that features a modern, creative and stunning design to it. The perfect way to showcase your portfolio or blog with a smooth and creative visual experience, this template is sure to keep your users engaged. Built on the powerful and functional HTML5 and CSS3 coding, this template gives you the full control over how you want your website to be. It is also fully responsive and retina ready making sure it adjusts and fits any device screen type. With the templates, you get over 50 ready to use HTML files that you can customize. 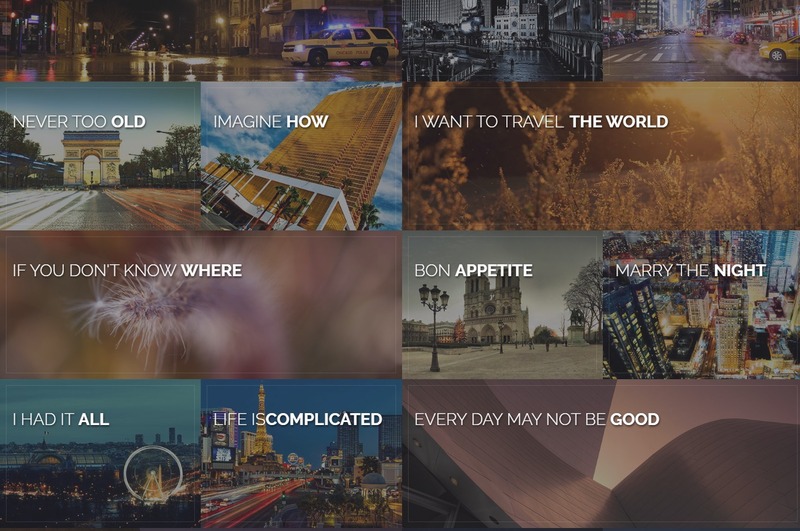 For an added touch of innovation, this template also supports background videos from YouTube, Vimeo or HTML5. You can also opt for the Parallax background image as well. The CSS files are well-commented and well-organized so that it is easy to customize. You also get Carousel and Slider option to display media files. It is also cross-browser compatible features FontIcons, as well as google fonts. Other advanced options of this template include- Smooth User experience, Mobile Menu, Lightbox, Sortable Portfolio, Multiple header and Menu options. Quadra is a powerful and high-performing website template that is flexible enough to suit all types of websites. Pre-built with tons of amazing looking templates and tons of customizing feature, this template is also an ideal choice if you are a blogger of any sorts. Built on the powerful Bootstrap framework, the grids and layouts of this blog template is pixel perfect. Bring out your imagination to life easily with Quadra. Choose from over 70 different One Page and Multi-Page demos as well as from over 650 different Page templates. Select the one that best suits your preference and adds elements easily using the shortcodes that are available. Add icons as well as amazing typographies and make your blog way more attractive. Quadra is not only just another template, it is a perfect design tool to get your website stand out from the crowd! Probably the best choice you could make on your online journey, start out with Quadra today! It includes over 16 different HTML files that are ready to use along with 9 color scheme options. Choose to add creative and innovative fonts and icons from Google Fonts as well as Fontello Icons. In addition to this, you also get Sliders and Galleries as well as smooth animations that you can include. Furthermore, this template also includes the option to add dropdown and megamenu as well as a sticky menu that stays intact no matter how far down your users scroll down. Extremely easy to customize and use this template is surely an ideal blog template you can use! 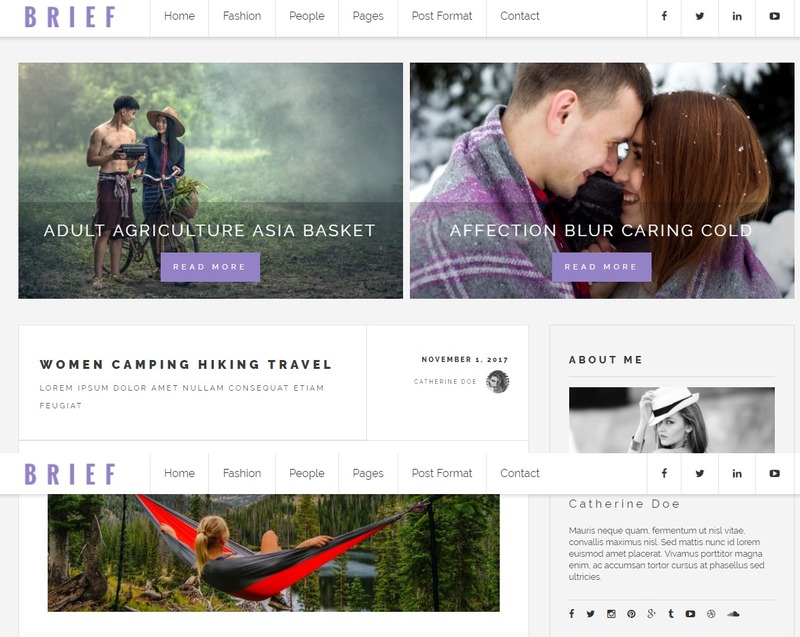 If you are looking to create a stunning blog website, then BeTheme is the way to go. It is a HTML5 multi-purpose website template that you can use to create almost any type of website niche. With tons of layout options as well as customizing elements there are unlimited possibilities with BeTheme. Visually-appealing with a feature-rich aspect, this template is also fully responsive as well as retina ready. Modern and clean as well as professional looking layout, this theme is perfect to start your online journey. You have over 320 different demos you can choose from with appealing and amazing design. Choose from the creative, corporate, newspaper, magazine as well as blogs and entertainment websites templates. In addition to this, you also get multiple grid layout options along with 20 customizable header styles. Perfect for portfolios as well as blogs, this template features wide and boxed layouts. Furthermore, this template also includes a built-in mega menu with over 18 PSD files with UI kit. You can then add custom Google Maps to integrate your business location. Not only this, but you also get smooth scrolling effect as well as amazing CSS3 animations. Once you invest in this creative blog template, you are also assured of lifetime support and updates whenever necessary. Boo is another amazing HTML5 website template that is visually modern, clean and unique. Flexible and suited for almost any website niche, you can even use it to create a perfect blogging platform. Featuring a responsive and retina ready design, this template also includes a free website builder. This means that you no longer need to have any coding or digital knowledge as you can easily add all the necessary elements with the website builder. Easy to use with the user-friendly interface, this premium template is surely worth the investment. With over 100 different templates that you can choose from, there are tons of options. Get creative with the pre-built websites and over 80 inner pages that you can use to start on. In addition to this, this template works seamlessly on any device as the layout is based on a mobile-first concept. The template is also SEO friendly and supports the RTL multilingual languages. You can also use and customize the gradient colors with a front-end color picker. Other amazing and advanced features that this template includes- Interactive animations Touch Swipe, Sticky Header menus, as well as creative boxed and wide layouts. Additionally, you also get the option to add a video background from YouTube, Vimeo as well as HTML5. 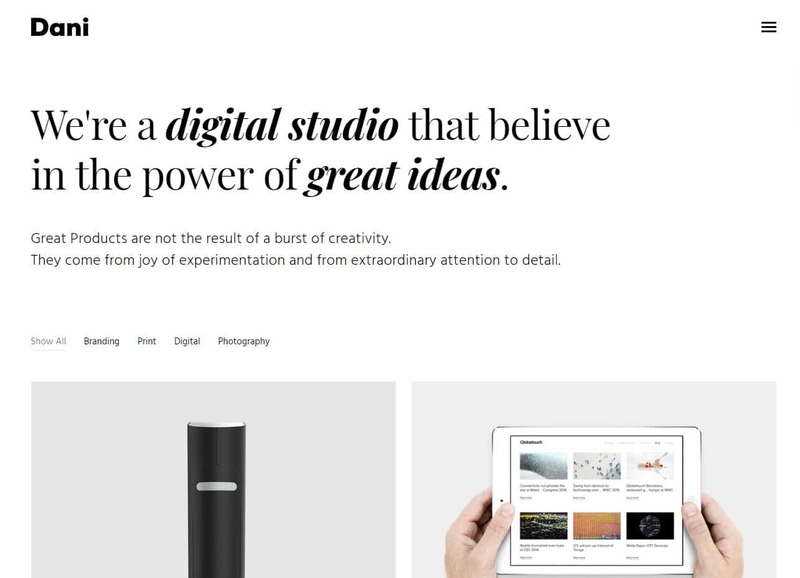 Mono is an impressive and amazing HTML5 creative portfolio and blog template that is packed with advanced features. Optimized for speed and performance, this template is the perfect way to start your online journey with a global audience. Fully responsive and retina ready, this template looks stunning no matter which device it is on. Built by professionals it includes everything that you require to create a fully functional and impressive website. Highly organized and documented, this template is easy to use and customize with ease. Powered and built with the powerful Bootstrap framework, this template is the ideal choice for you. It features 30 stunning and unique Home Pages that you can choose from. You also get tons of Navigation Layouts that you can choose to use. Built on the powerful Bootstrap framework, this template is powerful as well as lightweight. With over 100 elements that you can add to your site, there are also 50 button styles you can use. Furthermore, this template also includes 11 Page Preloaders that you switch from. In addition to this, the template also includes Parallax Image and Video background image option. Get creative and use the Sliders and Carousels included with the package. Not only this but with this awesome portfolio and blog template you also get beautiful hover styles as well as smooth scrolling effects. Next Blog is a complete HTML5 blog template that is visually stunning and equally-feature-rich. The ideal blog template for personal blogs, news as well as magazine websites, Next Blog features a clean and professional outlook. Built and powered by the powerful Bootstrap framework, this template is fully responsive as well as retina ready. This means that your website looks stunning no matter what device your users are on. The clean and valid HTML5 and CSS3 codes used are clean and well-commented so that it is easily customizable. The template offers plenty of amazing features and makes sure that your blog or website stands out from the crowd. You get unlimited colors schemes you can choose from. In addition to this, you also get tons of creative fonts and icons that you can use from FontAwesome as well as Google Fonts. The beautiful design and layout also feature amazing and clean animation effects as well as solid page load effects. Fully customizable and with tons of amazing elements and customizing options, build the website you always wished for! 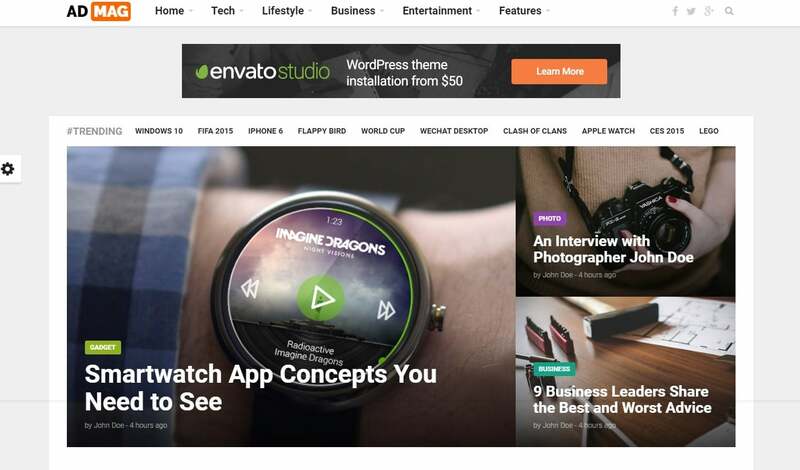 Admag is a creative and visually stunning HTML5 magazine and blog template that you can use to create an engaging and feature-rich website. Perfect for blogs of any niche as well as editorial websites, this template is fully-responsive and retina ready. The minimal and unique design adds the touch of professionalism. With tons of amazing options for adding elements and customizing, this template is sure to win over your viewers and keep them hooked for hours on end. The minimal and unique homepages that this template feature is visually mesmerizing. You also get an unlimited color option that you can choose from along with the dark and light versions of each. Based on the powerful Bootstrap framework, you also get unlimited Ad Spaces. The boxed and wide layout adds the extra appeal to the look. More advanced options included with the templates are- navigation mega Menus, Parallax Post Image, Sticky header & Sidebar, Off-Canvas menu as well as custom font options. 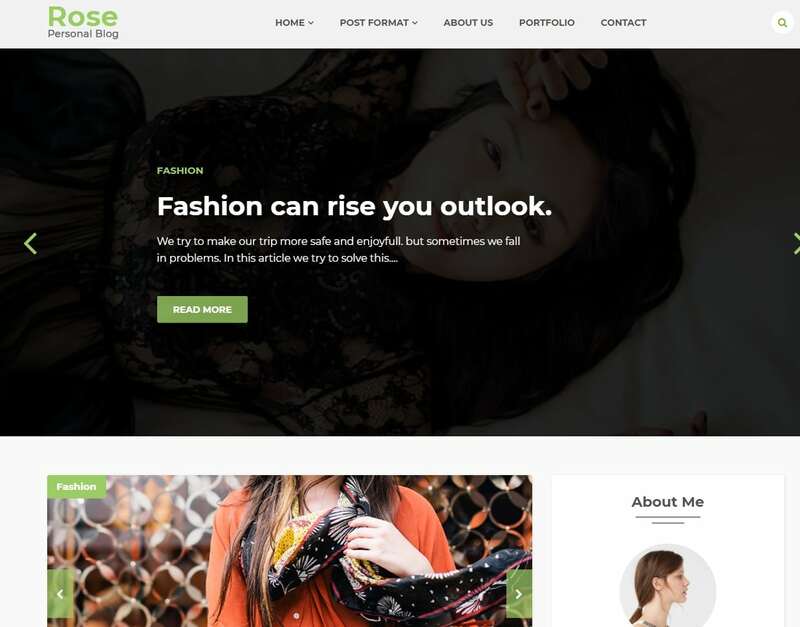 Rose is an elegant and unique HTML blog template perfect for blogging website of all niche. Whether you want to talk about your travel journey, food, fashion or simply other relevant topics, this template allows you to create the perfect blogging platform. With a minimal and clean aspect to the design, this template maks sure that your contents are the main focus. Elegant and classy this template design is also fully responsive as well as retina-ready. With amazing outlook as well as tons of advanced options this blog template is surely one of the best out there. Based on the powerful and effective Bootstrap grid system and framework, this template includes the W3C Validate Codes. It includes a total of 18 different Pages you can choose from that all feature clean and modern aspect. The codes included are well-commented and well-organized giving you the ease to customize. The template is also SEO friendly and cross-browser compatible. In addition to this, you also get 5 different Home Page variations that you can choose from. Once you invest you are assured of dedicated and friendly support and daily updates whenever you need them. 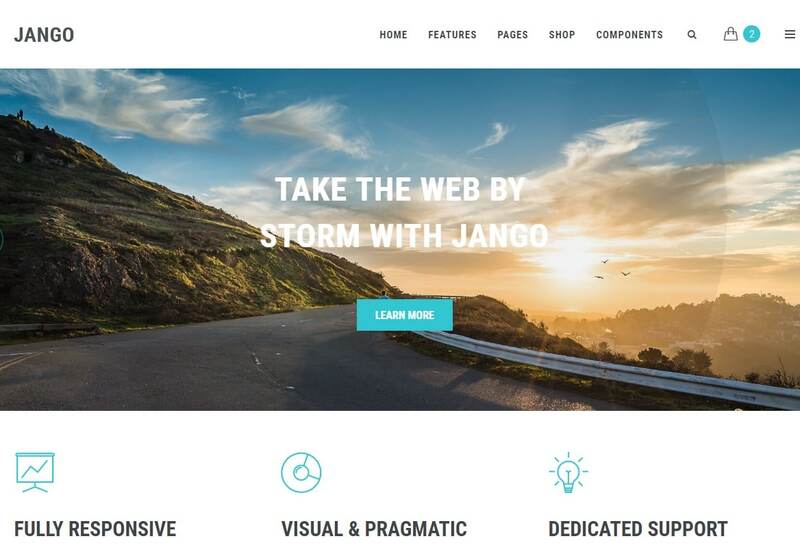 Jango is a professional looking website template that is both flexible as well as incredibly responsive. Being multi-purpose and built on the multi-concept guidelines, it meets the requirement of almost all types of websites. Whether you own a business, restaurant or want to create an online shop or start out your journey as a hobbyist or professional blogger, Jango makes sure that it meets all of your requirement. With a blazing fast development alongside the component framework, this template surely a great choice. Choose from over 300 component layout demos to start out and customize them using the 22 color schemes it offers. Making sure that none of your global audience is missed out, the template now also supports full RTL support. You also get 3 customized layout demos, 21 header demos, 5 sidebar demos as well as 10 footer demos. Choose the one that best suits your needs and create the perfect platform you always wished to own. The responsive, creative and flexible layout also features developer friendly codes. Blog Master is another amazingly stunning HTML5 blog template that we recommend our users. 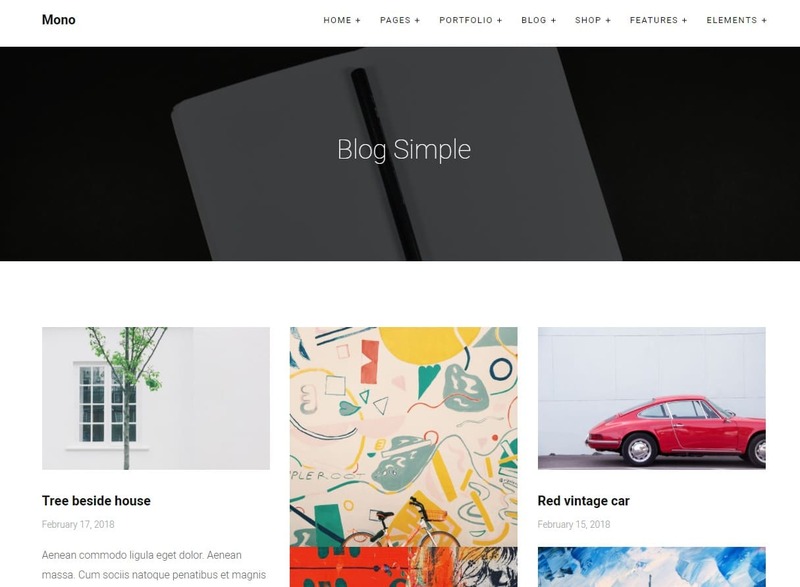 With a responsive and retina-ready design that reflects a clean, unique and modern interface, this template is the ideal choice for you to start your blogging journey. Best suited for blogging websites, it is also flexible enough to suit magazine or news-based websites. Combination of efficiency and beautiful layout, this template is surely one of the best blog templates that you can find out there. With over 15 HTML files you can easily add elements to your site in a matter of minutes. In addition to this, the template also includes 5 Home Page variation as well as 10 unique Inner pages that you can choose from. Stay connected and interact with your users using the integration with AJAX Contact Forms. Furthermore, this template includes advanced Post formats as well as separate Author Page. Based on the powerful Bootstrap framework and grids, this template is simply pleasing to the eye. Pixel perfect with tons of amazing customizing options, this blog template is sure to keep your users engaged. If you are thinking of starting your online platform or blogging website then Brief & Blog is the ideal choice. 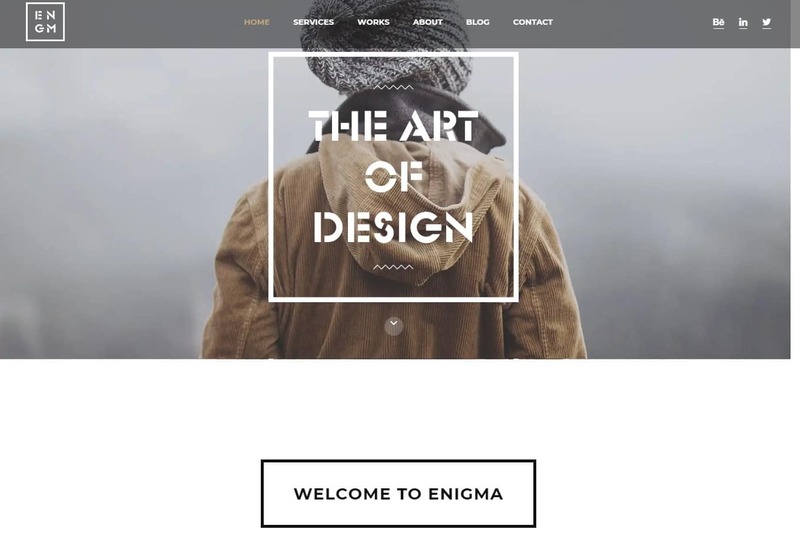 Elegant, modern as well as visually amazing, this premium HTML5 blog template is aesthetically beautiful and efficient. Best suited for personal blogs, this template is flexible enough to suit blogging website of any niche. With a responsive and retina ready layout, this blog template makes sure your website always look stunning no matter which device your users choose to use. Built on the powerful Bootstrap framework, it is built with the advanced and effective HTML and CSS3 codes. The template is SEO friendly and is easy to customize. Add a touch of creativeness with custom fonts using the Google Fonts and Font Awesome. Optimized for SEO, this template makes sure that your website is searchable and ranks high. The HTML5, CSS3 and the jQuery codes used are well-commented and documented. The template is also cross-browser compatible and includes a valid HTML Markup. The clean and content focused layout is sure to keep your users engaged. Furthermore, you can even add carousels and sliders to display your media files in an attractive way. Hazel is a simple, creative as well as modern HTML blog template that is great for portfolios and blogging websites. The template is hundred percent responsive and features tons of modern and advanced features. Visually minimal and clean, it gives you the full access to a personal space to share your contents with a global audience. No matter which niche and category you want to talk about, this blog template is flexible enough to suit all your requirements. Built on the powerful Bootstrap and jQuery framework and coding, this template is amazingly effective. Choose from the 10 different Demo Pages to start or use the prebuilt 10 Home Page variations. In addition, you also get choices from 8 different Category pages as well as 7 different blog pages. Furthermore, this template also features the premium Revolution Slider which allows you to display media files in an appealing way. 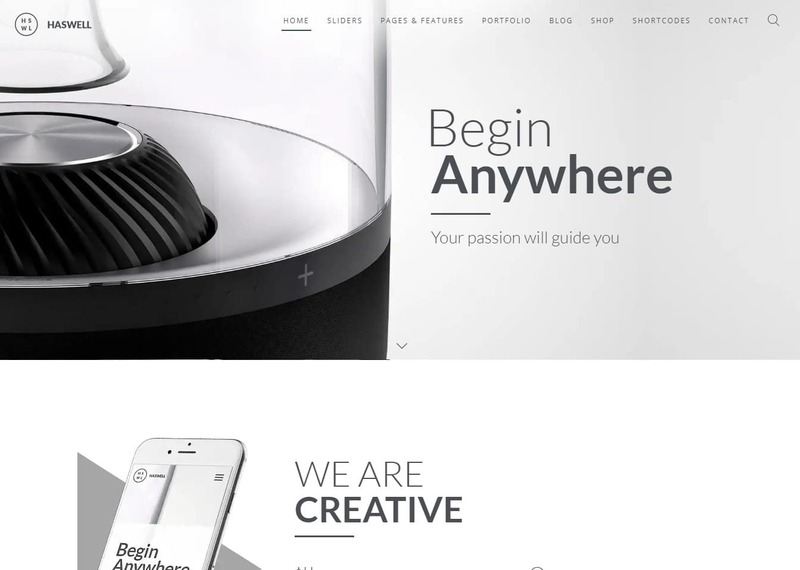 This blog template also features Parallax sections as well as smooth animation. The clean and neat design of the template is built with clean-coded and well-commented HTML and CSS3 codes. It is also highly customizable which makes sure that you get the perfect website that you always wished to own. 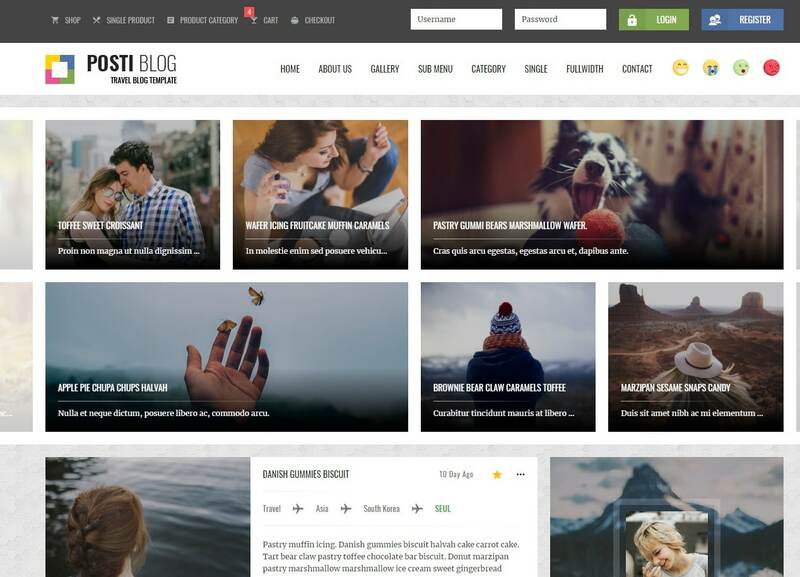 Posti is a fully responsive and retina-ready HTML5 blog template that is best suited for blog sites. Flexible enough to suit any blog niche or category, get unlimited possibilities with this template. Clean, modern and amazing interface, any content you add is sure to look stunning and engaging. Built on the powerful and advanced Bootstrap framework, this template is amazingly feature-rich. The codes are clean and well-commented making sure that the customizing process is also easy. With the responsive template, you also get social integration with Yuube API as well as Instagram API. More option to stay connected. this template also provides working Contact Form for your users to add their details. The Single Page design features a sticky sidebar as well. In addition to this, you also get the option to add creative fonts and icons using the Google Web Fonts as well as Font Awesome integration. You can even use the fullscreen slider to add the extra appeal that it has been missing. 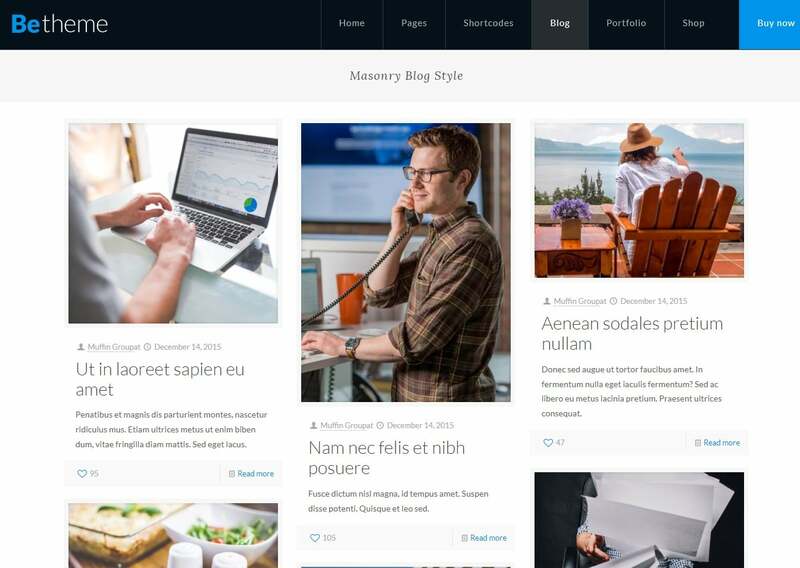 An awesome blog template, Posti is the ideal choice for you! Talking about flexible and adaptable options for you to try out, Porto is a responsive and creative HTML website template. It focuses on the multi-purpose concept giving the users the flexibility to do whatever they wish to. The template is also completely responsive and retina-ready. Pretty much the whole package in itself, it comprises of amazing pre-built demos, Home Pages as well as Inner Pages that you can choose from. Get over 600 HTML file templates that are all easily customizable. And if you are looking to start a business blog, personal blog or professional blog of any kind, this template is the perfect start. It is powered with the powerful Bootstrap framework. Additionally, it is also SEO friendly and cross-browser compatible. Choose from hundreds of different Home Page styles whether One or Multi-Page. That too within a matter of minutes. Getting into the variations and the styles, you also get amazing looking headers and footers alongside an exclusive style switcher. Customizing options also include a huge range of free Google Fonts, Icons, as well as extensive colour schemes. A responsive slider Revolution Slider allows you to easily showcase your media files with 3D transitions. As it is high-performing template, you get an astounding loading speed. The pixel perfect design also has amazing gallery, blog, and useful layouts you can use. To ensure that you can reach out to the larger audiences, the template is also RTL friendly and translation ready. All the CSS and HTML codes that are used are user and developer friendly. The clean codes also access a range of other useful UI components and elements. No matter what type of site you are going for, Porto assures the user of the best possible result. Another great example of high-performance and flexible template is Foundry. 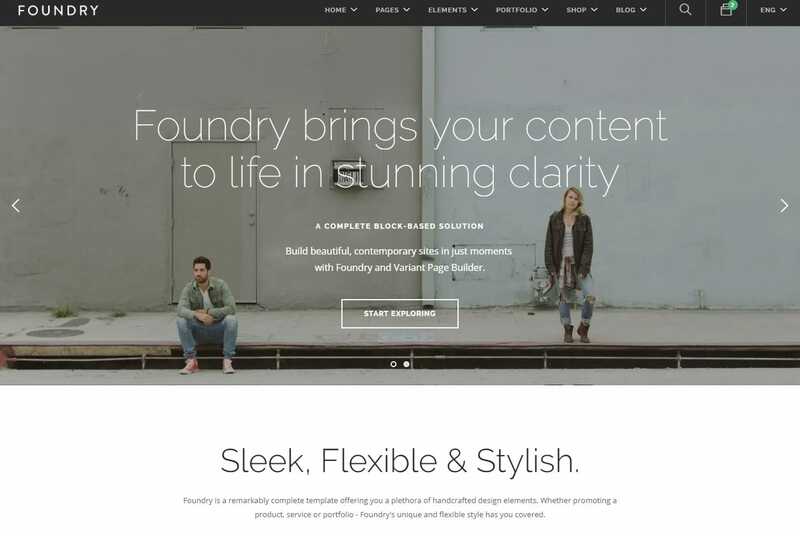 A completely responsive and retina-ready template, Foundry is simply an amazing option to opt for. Why? Well not only are the visuals aspect of this theme effective and stunning, it also comes with tons of personalizing and user-friendly options that you might find handy. That’s right! As the overall concept of this template package is multi-purpose, you can create almost any type of site you prefer. The pixel-perfect layouts are ready for business, portfolio, blogs, professional sites and more. 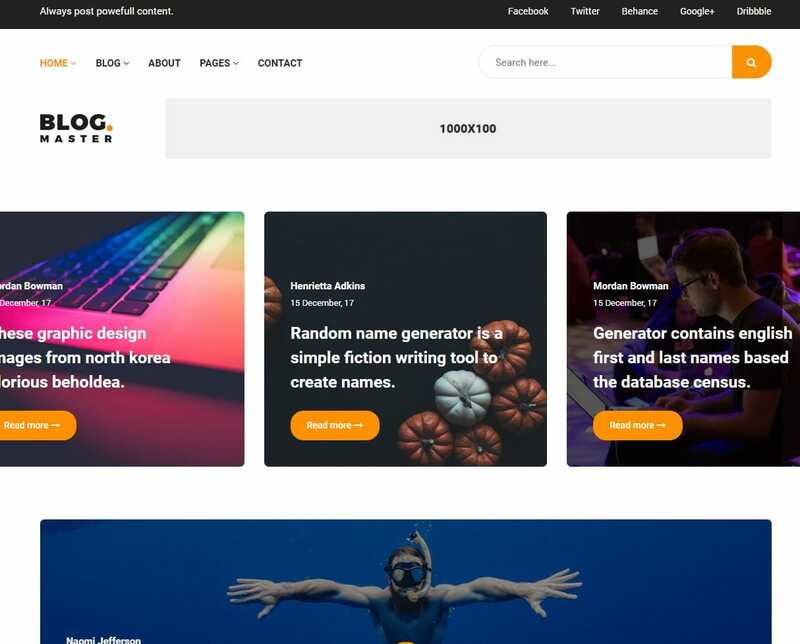 Robust and powered with the Bootstrap framework, this template is sure to take your site to the next level. Enhance the features even more with the Free Google Fonts, icons and typographies to match your preference. The best part, however, is the Variant Page Builder that comes with the package. It makes the process of editing and modifying any element a piece of cake.Foundry also has over 100 fully responsive HTML template files at your disposal. You can even switch between the Dark and the Light version of the theme. But that’s not all, get an unlimited range of colour schemes that you can choose from. It is also optimized SEO and speed ensuring a great ranking site. Talking about connecting with your audiences, you can also add social media icons, social feeds, and more. The Flex Slider supports every media file type whether they are still images or videos. The Google Map API with retina map markers makes it easier to add your custom maps. And is that’s not enough, you also get stunning blog, shop, portfolio and business pages that you can easily modify to your needs. 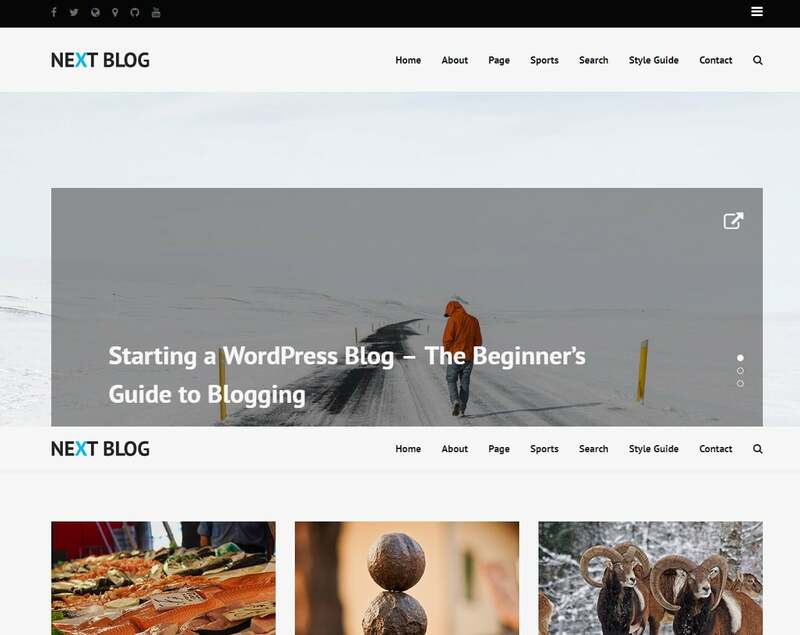 Designed especially for the bloggers out there, Orgato is a responsive HTML and Bootstrap based blog template. The overall style and design is based on the minimal and clean outlook. And whether you are a freelancer trying to start their personal blog, or a company person trying to start a company blog, it is perfect for it all. The main focus is surely the contents you wish to display on the site as not much distracting elements are included. That’s right! Even the typography and the spacing are created to offer the bloggers and their users the best writing and reading experience. The template is completely responsive and retina-ready. This ensures that no matter which hand-held device you prefer, your site always looks flawless. While the white and black colour scheme is the ideal reading and writing canvas that users usually prefer, you can easily change that if you want. Although minimal, it is highly flexible. You can change the icons, logos, header styles, menus and more. It comes with over 14 different HTML pages that you can use including 3 amazing Home Page design. Another great thing is the Owl Carousel that enables the users to easily add media files in an appealing manner. To keep things interesting you can arrange the files and contents you prefer with minimal effort. In addition to this, the template is also optimized for SEO which makes sure that your site always ranks higher. The SASS files used are also included with the package. The detailed documentation of the template assures the users of a problem-free experience. It is completely cross-browser compatible. Get 5-star support whenever you need only with Ogato. You is a great template to start off your very first professional blog website. Why? Because everything that is included with the premium package is checked on a professional level to ensure utmost efficiency. Each of the elements including the visuals is crafted with precision and are all responsive and retina-ready. As it is highly flexible and customizable this template caters to all your needs and requirements. It is powered with the Bootstrap framework and gives you easy personalizing options. And the process of creating a site with You is extremely easy. It comes with over 10 different niche based demos that you can choose from. The unique thing about this template is that it comes with features like FlexiShape which is sure to make your site stand out. Additionally, it is also integrated with the popular plugins like bbPress, WooCommerce as well as Contact Form 7. The Home Page and Inner Pages are all SEO optimized for Google Page Speed as well. Thanks to the powerful Skin Creator, you get an unlimited colour scheme as well. Talking about the skins and background, you can choose from image background, video background, parallax background and more. The template is RTL friendly and translation ready as well. To make things more interesting, you also get social media icons, unlimited sidebar and headers option and more. Additionally, you can install all the demos included within a matter of seconds. The Visual Composer also lets the user easily edit the components while previewing it Live. Another great feature is the TypeWriter plugin included that tends to your blogger needs. Another clean, minimal and simplistic blogger website template that is perfect for those looking for a professional blog. No matter which kind of blog you are going for, food, fashion, electronics, this template is flexible enough to match the niche. It is completely responsive and retina-ready so that each element you wish to display adjusts automatically to every device screen size. 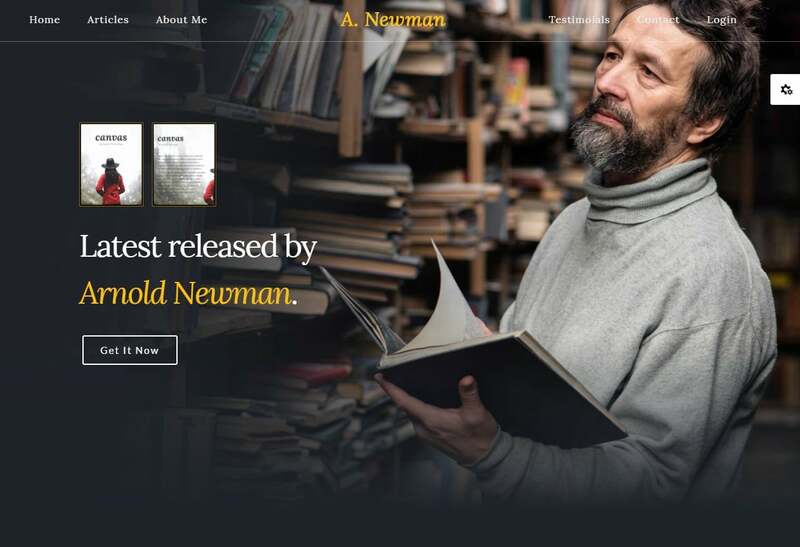 There are even 10 unique and stunning Home Page designs that you can choose from. You can add custom logos, add creative slogans, CTAs and more. In addition to the pixel perfect imagery, you can also choose to go for either One-Page or Multi-Page design. The great thing about this is that the options are extremely user-friendly, which means that no matter which device it is on, it still looks stunning. The simple, clean design is focused majorly on the subtle design elements. You get to choose from 10 different Home Pages to choose from. The variations include Sliders, Multi and One Page design, Vimeo and YouTube Video Background, Text Rotator and more. Thanks to the working Contact Form your clients can easily reach you. There are also a huge range of amazing looking icons and fonts that you can choose from. The touch slider as well as the stunning Revolution Slider makes adding media files a breeze. In addition to this, the creative blog pages included makes it great to share informative content you wish. The CSS and HTML codes used are all extremely clean and well-commented. 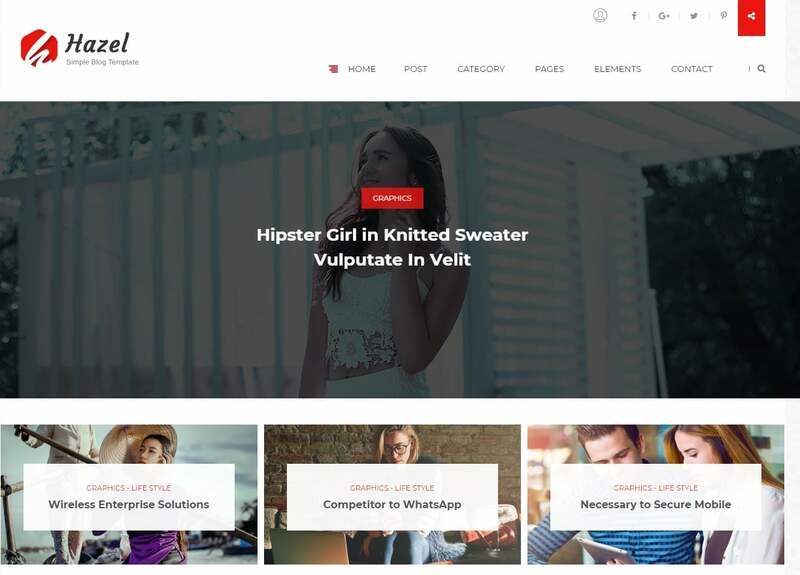 Designed especially for the creative crowd, Haswell is a versatile and flexible multipurpose HTML template. As it is highly customizable and comes with a range of amazing components for you to start with, you can easily start a blog, freelance site, professional corporate site, creative portfolio and much more. The style and the overall design structure is clean, minimal and simply beautiful. The template is completely responsive and optimized for all hand-held devices. It even includes a variation of multi and one-page design to choose from. The great thing is that it comes with an unlimited colour palette that you can easily switch to and from. As it is powered with the powerful Bootstrap framework, it is sure to reach all of the latest standards required. Get tons of shortcodes that lets you easily add useful elements with ease. With over 50 Homepages to choose from, get the perfect blog, gallery or corporate site! Adding to it, you also get pages for under-construction, maintenance, contact, testimonials and more. The PSD files displayed on the demo pages are also included with the package. Furthermore, you can also choose from the boxed menu, mega menu, hamburger menu, sticky menu option and more. To help your clients connect with you, you get MailChimp integration, Contact forms, Twitter and Flickr feed widget, and creative social media icons. In addition to this, it also supports multiple media file type including videos and images. The responsive Sliders and Carousels add the extra creative touch that you are looking for. Once you invest in the theme, you are also guaranteed of lifetime free updates. So what are you waiting for?